This past weekend I had an urge to bake muffins for some reason, but I couldn’t decide if I wanted something savory or something sweet. After some browsing and recipe searching, I decided to go with, well, both! Note to self: Don’t ever half two recipes in your head and bake them simultaneously again. I realized about halfway through measuring the ingredients for both recipes that I was just asking for a kitchen disaster. I took two completely unrelated muffin recipes, both with totally different measurements and ingredients, and decided to make half of each all in the same muffin tin. Let’s just say the odds were high that I would put the wrong ingredients in the wrong recipe, or completely screw up the measurements. I slid the muffin tin into the oven and held my breath. The timer went off and I breathed a sigh of relief. All the muffins were done, they rose properly, and most importantly, they tasted like they should. 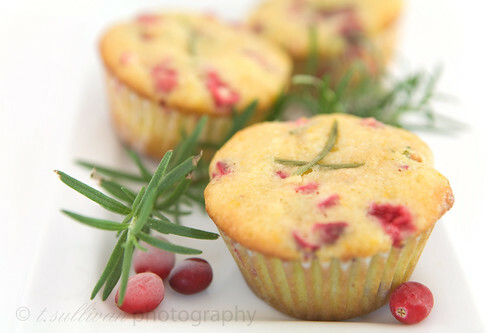 The sweet muffin recipe I chose for my baking adventure was Orange Cranberry Rosemary muffins. I’ve had those first two flavors together before, and I’ve had orange and rosemary together before, but never have I tried all three in one recipe. I’ve been saving a bag of cranberries in the freezer since last Fall and the rosemary in my herb garden has been doing very well, so I figured I had to give it a shot! And oh, I’m so glad I did. These muffins are a little sweet and a little savory. I was afraid the rosemary would make the muffins too… piney? But it doesn’t. There’s just a subtle hint of it’s woodsy flavor in the background, a nice way of rounding out the sweetness of the orange and cranberry. The rosemary just adds that little something that takes them from good to WOW. I think these would be great for company around the holidays. I will definitely make these again, probably in the Fall when it’s cranberry season once again! Oh and that other savory muffin recipe? Next week! The easiest way to chop the cranberries for the recipe is to just give them a pulse or two in a food processor. Dried cranberries can be substituted, but they will be sweeter than fresh cranberries. These muffins don’t rise much, so don’t be afraid to fill the muffin cups a little more than you normally would. Preheat the oven to 375°F. Lightly grease or line a 12-cup muffin tin. In a large bowl, whisk together the flour, baking powder, salt, and sugar. In a smaller bowl, mix the egg, orange juice, milk, and melted butter until combined. Stir the wet ingredients into the dry ingredients, until just combined. Fold in the orange zest, cranberries, rosemary and pecans (optional). Spoon the batter into muffin cups, filling to just shy of the top, and bake for 20 minutes or until a toothpick inserted in the center comes out clean. yay these look so delish. added you to my blog list. Reminds me of the Rosemary Goat Cheese muffins I saw at Mudhouse in Cville over the weekend. Josh, those sound really good too! I love goat cheese. These sound great to me. 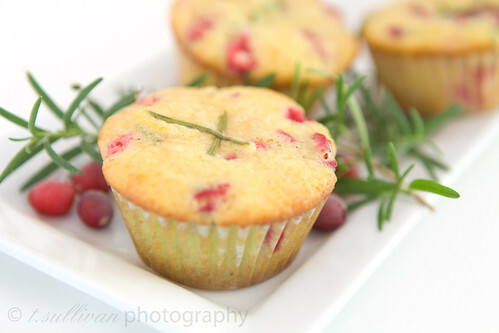 I like the sweet/savory combo and I love cranberry muffins. Nice photos. I love this flavor combination. I’ve had cranberry rosemary bread which is great but the addition of orange sounds fantastic! I love the combination of orange and cranberries! I’d never thought of adding rosemary but it sounds great! What a great sounding flavor combination! Love your picture! I made these over the weekend and they’re fabulous. The 3 flavors go so well together! My rosemary bush hasn’t fared too well this winter so I only used 1T instead of 2T and it made people say, “What is it that I’m tasting in there?” They were surprised and delighted it was rosemary. Great recipe, Theresa.